Now there is a new web browser out there available for the I-Pad tablets and Android devices. It is called Puffin Browser by CloudMosa! This new sleek web browser is developed for mobile devices and tablets in mind! It is created in such away where speed and efficiency is the top priority. It also has a built in customized flash player so now any I-Pad or Android devices can play flash content like games whereas before that wasn't possible on these devices. Upon initial review, it also seems to play flash content a lot faster. By faster, I mean the frame rate appears to be faster. Regardless of how it was loading on your desktop or laptop, when playing it using this browser, it just picks up speed. It is possible that the frame rate of the flash may be faster than the display frame rate of the tablet so this browser is designed to compensate for the hardware lag. The Puffin Browser comes complete with a game pad control. This control allows you to use the arrow keys that are used in most games and also 4 configurable buttons as "action" buttons. It seamlessly integrates with the browser and the flash game that you are currently on. When you activate this feature, you can see it transparent on the screen. The arrow key controls are on the left and the 4 buttons are on the right. When you use the arrow keys, the flash game or app behaves in that same manner. You can also click on a diagonal angle and it will simulate for example an up and a left with one tap on the screen. One of the cool things about Puffin Browser's integration with flash is the extended track pad. This track pad makes it easier for the use to move the mouse on games that require precision accuracy. It is a transparent box that is off of the flash interface that acts like a track pad on a laptop. It adjusts nicely to the screen and provides a easier way to move the mouse around. In order to simulate a mouse down instead of a click would be to use 2 fingers on the track pad. This allows you to drag and drop for applications. The track allows for better mistake room when pointing and clicking on the screen. This is because any movement with the finger will allow a proportional movement with the mouse pointer. The sound quality is also really good. However, I do notice that the sound sometimes seems to lag behind. I am not sure if this is a loading issue or simply because the tablet device is slower to begin with. The tablet device I am using to test this web browser is a first generation tablet so I will assume that general graphics/sound speed of the tablet device isn't quite there yet. The keyboard below also has some additions to it that allow you to tab around on the screen and more specifically your flash application. The "previous" and "next" buttons allow you to tab to each button on the screen, along with "cut", "copy" and "paste". 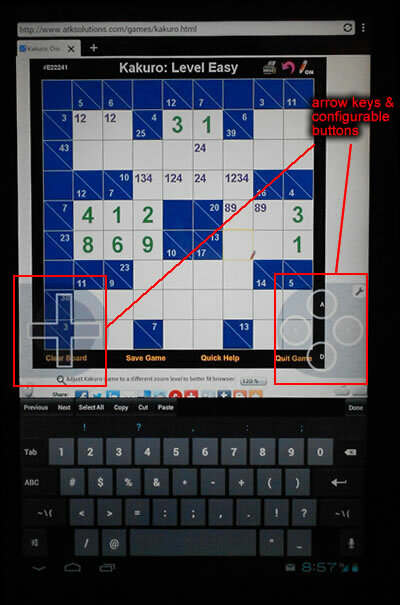 To give you an example of how versatile this web browser is, take for example this particular sudoku style game called kakuro, I've set up the arrow keys on the left side, the 4 default buttons on the right side "A" - view across combos, "D" - view down combos, "P" - toggle pencil-mark, and "X" - delete box. Below I set up the keyboard and and switched it to show a row of numbers across the top. So I would use the transparent arrow keys to get to my desired square (even diagonally works), use P to turn on pencil mark and use the numeric keys to enter the possibilities for each square. Puffin web browser gives me the complete flexibility to play a flash game like this and do it in a clean and concise way. I can use the arrow keys to navigate around the grid, special keys on the right to do specific things and the number keys below to enter digits in the boxes. For a tablet with this web browser, it really lets me focus on game playing again instead of screen tapping mistakes. it lets me take better control of the game again! So enjoy a new refreshing experience with the Puffin Browser by CloudMosa! Update 12/27/2018 - Adobe is no longer supporting Flash player after 2020. We have migrated all but 2 games to html5. We have beta copies of those 2 html5 as well. Please send email for links.